For a small business owner, an order from Wal-Mart means access to the 200 million customers who visit each week, plus the chance to grow sales and hire more employees. Meet four lucky owners. Company: Sargent Farms, Prairie Grove, Ark. By age 62, Dave Sargent tired of being the dairy farmer he'd been for most of his life. So he quit, and planted a small garden -- a third of an acre -- with yellow squash, zucchini, eggplant and blackberries. Once the vegetables came in, he went to his local Wal-Mart to ask if the store was interested in buying his produce. The manager agreed. A decade later, he's now selling $1.5 million worth of produce each year to dozens of Wal-Mart stores across the country. 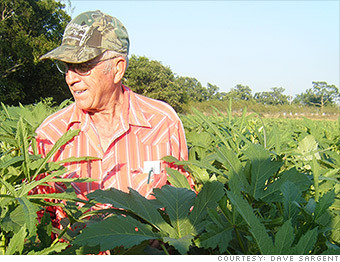 He now has 1,400 acres, and has expanded into growing cucumbers, green beans, wheat and soybeans. His business got so big that he took on a partner. In the summer, the farm employs about 40 workers. "I owe all of my success to Wal-Mart," he said. "Without it, I would be nowhere."